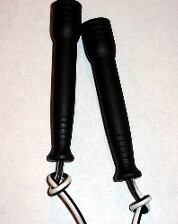 A few years ago, I published an introductory article on jump rope training (Part I). Since writing the original piece, I’ve received several questions regarding various aspects of rope training and rope selection. This article will address many of these questions, and provide another sample video with demonstrations of several easy to learn rope skipping techniques. Personally, I recommend a lightweight speed rope. Speed ropes are inexpensive and excellent for conditioning and coordination. Many weighted ropes are also fast, but not as effective when performing various criss-cross drills. 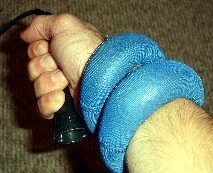 If you wish to incorporate resistance into your rope work, I suggest wearing an inexpensive pair of wrist weights. This option will allow you to maintain the speed of the lightweight rope, and will not interfere with various tricks that you wish to perform. Many weighted ropes are bulkier in nature, thus not as effective for advanced turning styles. You can have the best of both worlds by adding weight separately. As you can see, it is easy to add one or two pounds to each arm. In the video below, I begin with a demonstration of rope work with wrist weight resistance. As you will see, the weights do not affect the turning speed of the rope. The addition of weight is an effective way to develop muscular endurance in the shoulders and arms. Many fighters struggle with endurance in the shoulders. Weighted rope work is one solution to this problem. You do not need to add weight to each rope workout, but occasional use is certainly effective. Many readers of the site have asked for recommendations regarding speed ropes. There are many options with considerable differences in price. Fortunately, you don’t need an expensive rope. 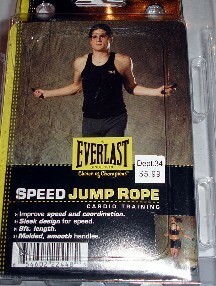 In the video below, I am using an inexpensive Everlast speed rope. I bought this rope for $5.99 at a local sporting good store. There are faster ropes available, but the turning speed is certainly fast enough for most users. As for the durability of these inexpensive ropes, a simple modification can help extend the life of your rope. One of the keys to rope longevity is determining potential areas of breakage. With most inexpensive ropes, focus on where the handles meet the actual rope. 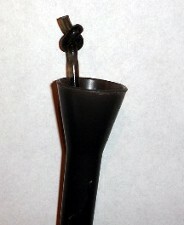 Many handles will slowly degrade the rope with regular use. The handles eat into the rope until it finally snaps. You can prevent this problem by taping the areas where the handle meets the rope. I use strong electrical tape to correct this problem. Start by pulling the handle down the rope, so the ends are exposed. I then wrap the area that will be exposed to handle wear. As you can see above, I have taped the ends, and then pulled the handle back over the taped area. If your tape starts to wear, it is easy to replace. This will prevent the actual rope from experiencing wear and tear. 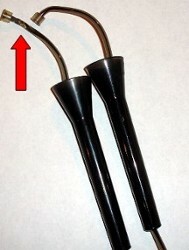 The image to the left shows how one end has worn down, while the other handle is still in perfect condition. The arrow points to the worn area (where the rope meets the handle). I used this rope for approximately 6 weeks. 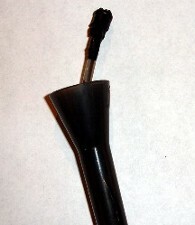 One end was taped (right side), while the other end was not protected. Clearly, the taped side has held up very well. Rope length plays an important role in determining the speed of your rope. Many users will need to trim up to a few inches from their rope. If your rope is too long, you can use one of the methods below to customize the rope to your body. Perhaps the easiest approach is to tie a knot directly under each handle. This option comes in handy if you are using a rope that is not your own (ex. 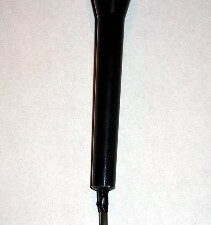 a gym rope). Another option is to snip the end of your rope, and then tie a small knot. You will then pull the knot down into the handle. The knot will prevent the handle from slipping off of the rope. You should do this to each side to ensure an evenly balanced rope. The video below provides a few demonstrations of some easy to learn rope skipping techniques. Many readers have asked to see these techniques isolated, rather than mixed together in a freestyle routine. For this reason, I have included some brief clips of a few variations. 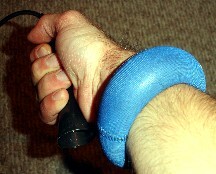 First however (as mentioned above), I begin with a demonstration that shows how wrist weights can be added to the rope without detracting from turning speed. I’ve mixed together a few variations to highlight that the weights do not interfere. Following this demonstration, I have then separated a few turning techniques that are fairly easy to learn, and useful additions to any conditioning workout. Sprint In Place – The first variation is the easiest to learn. This is a basic sprint in place turning style. The emphasis is on turning speed, and high knee action. Your goal is to turn the rope as fast as possible, while simultaneously lifting the legs as fast as possible. Although this variation may not have the “flashy” look of some other techniques, this is perhaps the best turning style that you can use for interval training. Keep it simple, and focus on a top speed effort. Double Unders – Next, I demonstrate the double under. As mentioned in Part I, to perform a double under, you will make two turns of the rope for every one jump. Keep the feet together, jumping with both feet at the same time. Stay light on your feet, once again striving for a top speed effort. Double Unders With Criss-Cross – The criss-cross is then added to the double under. This variation is also excellent for coordination and conditioning. It can be slightly frustrating to learn, but is actually not too difficult once you have mastered variations 2 and 3. We have had amateur fighters come into the gym with no jump rope ability who were able to perform this variation with ease after a few months of practice. Crossing The Rope In Front of The Body – In the final sequence, I demonstrate a few variations of crossing the rope in front of the body. This variation is used to incorporate some added rhythm and coordination within your main rope workout. You can cross the rope with almost any turning style (ex. in between double unders or in between a sprint in place sequence). As you can see within the video above, you do not need an expensive rope to benefit from this highly effective modality. All athletes can benefit from the conditioning and coordination that will come from regular rope work. If the rope is new to you, expect some frustration, but also remember that practice is the mother of all skills.